My friend Susan and I get terrible migraines. Trust me, it's not something we enjoy commisserating about as we step out to get lunch every day. Now, hers are much worse than mine -- but we both are chronic sufferers. And until recently, nothing seemed to help me short of taking Excedrin Migraine and lying in a dark room with a washcloth over my forehead. 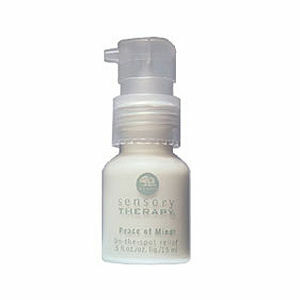 That is, until I found Origins Peace of Mind On-the-spot Relief. I don't know how this tiny bottle packs such a big punch ... but somehow, whenever I start to feel nauseous or my head feels as though it's swelled to three times its normal size, a bit of this miraculous potion really seems to help. How does it work? It's simple. You take three pumps of the formula, massage it into your temples and earlobes, and just sit back. Within moments, you'll feel a tingling and start to smell a minty, fresh aroma that calms you instantly. I've been using this every time I get a migraine -- sadly, much more often than I deem fortunate -- and IT WORKS EVERY TIME. This fabulous little invention is available for $12 at beauty.com. And throughout the month of October, Origins will donate $35,000 from the sales of this product to the Breast Cancer Research Foundation. That's enough motivation for me to stock up and say goodbye to my migraines for good. Thats such a great idea. I wonder what essential oils are in it that work so well? I use grapefruit and peppermint at work to make a room spray that wakes me up when I'm feeling sleepy, and it works pretty well, so I have no doubt that this is a good idea for headaches.